Example of samples from two populations with the same mean but different dispersion. The blue population is much more dispersed than the red population. All the above measures of statistical dispersion have the useful property that they are location-invariant and linear in scale. This means that if a random variable X has a dispersion of SX then a linear transformation Y = aX + b for real a and b should have dispersion SY = |a|SX, where |a| is the absolute value of a, that is, ignores a preceding negative sign –. Variance (the square of the standard deviation) – location-invariant but not linear in scale. Some measures of dispersion have specialized purposes, among them the Allan variance and the Hadamard variance. For categorical variables, it is less common to measure dispersion by a single number; see qualitative variation. One measure that does so is the discrete entropy. In the physical sciences, such variability may result from random measurement errors: instrument measurements are often not perfectly precise, i.e., reproducible, and there is additional inter-rater variability in interpreting and reporting the measured results. One may assume that the quantity being measured is stable, and that the variation between measurements is due to observational error. A system of a large number of particles is characterized by the mean values of a relatively few number of macroscopic quantities such as temperature, energy, and density. The standard deviation is an important measure in Fluctuation theory, which explains many physical phenomena, including why the sky is blue. In the biological sciences, the quantity being measured is seldom unchanging and stable, and the variation observed might additionally be intrinsic to the phenomenon: It may be due to inter-individual variability, that is, distinct members of a population differing from each other. Also, it may be due to intra-individual variability, that is, one and the same subject differing in tests taken at different times or in other differing conditions. Such types of variability are also seen in the arena of manufactured products; even there, the meticulous scientist finds variation. In economics, finance, and other disciplines, regression analysis attempts to explain the dispersion of a dependent variable, generally measured by its variance, using one or more independent variables each of which itself has positive dispersion. The fraction of variance explained is called the coefficient of determination. A mean-preserving spread (MPS) is a change from one probability distribution A to another probability distribution B, where B is formed by spreading out one or more portions of A's probability density function while leaving the mean (the expected value) unchanged. The concept of a mean-preserving spread provides a partial ordering of probability distributions according to their dispersions: of two probability distributions, one may be ranked as having more dispersion than the other, or alternatively neither may be ranked as having more dispersion. 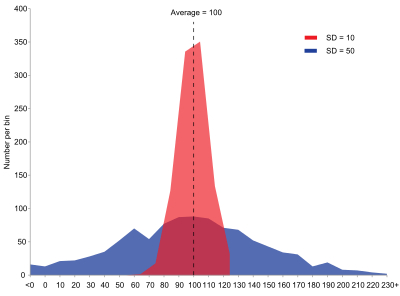 Wikimedia Commons has media related to Dispersion (statistics). ^ NIST/SEMATECH e-Handbook of Statistical Methods. "1.3.6.4. Location and Scale Parameters". www.itl.nist.gov. U.S. Department of Commerce. ^ McQuarrie, Donald A. (1976). Statistical Mechanics. NY: Harper & Row. ISBN 0-06-044366-9. ^ Rothschild, Michael; Stiglitz, Joseph (1970). "Increasing risk I: A definition". Journal of Economic Theory. 2 (3): 225–243. doi:10.1016/0022-0531(70)90038-4. This page was last edited on 24 February 2019, at 19:04 (UTC).